Bridal hair vines have become so popular over the last few years and are absolutely set to continue that trend into 2018. No wonder as these beauties are so flexible and easy to wear. They particularly suit the low loose half up do’s that brides are loving these days. And bridal hair vines are also perfect for brides wearing plaits in their hair for their weddings. As wedding hair vines can be worn woven and twisted through a low loose plait. This is one of the top ways for brides to wear bridal hair vines. It is relatively simple to wear your hair vine in a plaited up do. It’s even straightforward to weave your hair vine into a simple plait along the side of your head if you’re wearing your hair down. 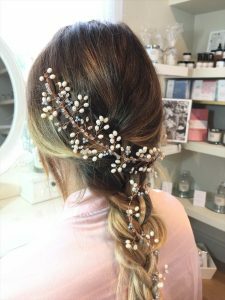 Depending on the size and width of your bridal hair vine there are several options for how your hair stylist (and we recommend top London Wedding Hair and Makeup Artist Tori Harris!) can weave it in. If your hair vine is long and thin, you can actually weave the hair vine directly into the plait. Pin the top of the hair vine just where your plait starts (there should be a little loop at the top of your bridal hair vine). Then simply add the hair vine to one of the three sections of hair as you are plaiting it. How To Wear Wide Bridal Hair Vines In A Plait. If your bridal hair vine is wider, like in the image on the left, it may be easier for your hair stylist to create your plaited do first, and then simple pin the hair vine over the top of your hair style. This way you will see the full detail of your beautiful headpiece without it getting lost in your hair. Either way, your bridal hair vine is sure to turn heads as you walk down the aisle. It is such a stunning, classic wedding hair accessory that really suits the loose, natural hair stylists that brides are favouring today. If you’d like to read more about wedding hair vines and how to choose the perfect one for your chosen hair style simply click here to our definitive guide on wedding hair vines. This gorgeous crystal bridal halo is handmade using beautiful Preciosa clear crystals in two complementing sizes, twisted on gold, silver or rose gold wire. Finished with a silver, gold, or blush self-tie ribbon to complement the metal colour.